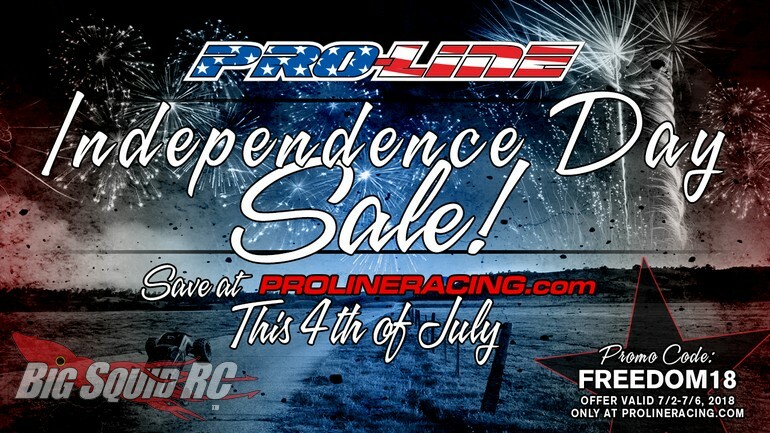 Pro-Line Independence Day Sale « Big Squid RC – RC Car and Truck News, Reviews, Videos, and More! We know how hard you guys bash your trucks. You send us pictures all the time of your monster truck 20 feet off the ground in the middle of a triple backflip. Bashing is what we do here, so we know just how hard our readers are on their rigs. If your bash-machine is in need of new tires, wheels, body, or some other upgrades, Pro-Line has announced a special Independence Day Sale. Pro-Line not only makes the best race tires you can buy, but they also hook up the basher crowd with favorites like their scale bodies and Trencher monster truck tires. Through July 6th you can save 15% off anything on their website, use This Link to start saving some cash. Click Right Here to read all the latest Pro-Line news on BigSquidRC.